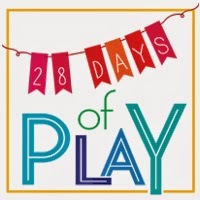 Today I have the pleasure of participating in Rachel Cedar's 28 Days of Play series. For the month of February and into March, parents are sharing their thoughts on the subject of play. I've been reading along and there have been such wonderful insights and revelations about the way we as parents approach play with our children. It's truly an honor to lend my words to this series, and join the other moms and dads who are opening up about this complicated and full topic. "I had an entirely different essay in the works. One filled with neat and tidy truths about how my family and I bring play into our lives. But the thing is that the neat and tidy truths don’t always give you the full story. The messy, won’t stop tugging at you truth, that’s where the beauty lies." Comments are closed here, but I'd love to read your thoughts over on the You Plus Two Parenting blog! Thank you for running such a beautiful series, Rachel! And a big thank you to Lindsey for connecting me with the project. Click on over and join me!